Many of these new local tracks would have made an excellent soundtrack for Halloween, but you didn't know about them yet. That's too bad. Below are nine songs from Kansas City and Lawrence acts that can soundtrack your first week of November and beyond. 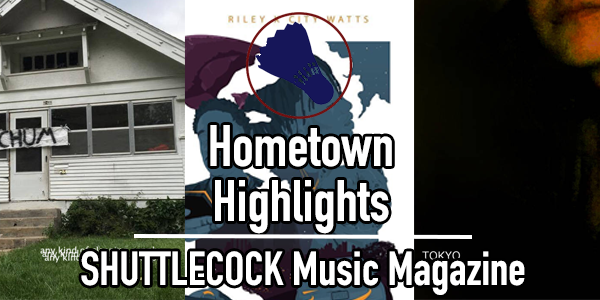 Hip-hop, piano tunes, weirdo pop made by punks, and more is explored on this week's Hometown Highlights. Shortly after the grim piano hook is established, Caviart rapper City Watts comes skittering onto the track with one of the catchiest choruses Kansas City has heard all year. Watts shouts out his friends on each side of the city. Before long, Riley wanders in to deliver a verse in his signature laid back flow, comparable to that of rappers like Smoke DZA or Domo Genesis. A verse from up-and-coming Ohio rapper Insomniac Lambs solidifies the track as the highlight of Watts and Riley's joint EP "The Speez." Natural Man & Miss Lady - "Side A"
Warm Bodies bandmates Olivia Gibb and Ian Teeple have united for a side project even zanier than you can imagine. Natural Man & Miss Lady's debut release is called "Wow! That's What They're Call Music Now?" Side A of the 30 minute tape features the two singing original songs composed with fuzzed-out guitars, vintage synths, and drum machines. The songs end up landing somewhere between punk, 70's pop, and delightfully strange elevator music. Listen for the Ramones cover around the four minute mark. Rick Maun - "Victory Laps"
Often functioning solely as a beatmaker, Rick Maun steps up and grabs the microphone on nearly every song of his new "Momento" EP. "Victory Laps" is a wistful number that features Maun quietly, but passionately singing about a lost love over a beat that holds enough nostalgia to last several lifetimes. This track pairs well with the act of sorrowfully flipping through that shoebox of old Polaroids you keep under your bed. Any Kind Of Cleaning Supply - "idontrememberthelasttimeihadfun.net"
Anyone who knows Matt Perrin well at all knows about his affinity for the long lost subgenre known as "party thrash." The sound often seeps through in certain Bummer songs, but Perrin is calling all the shots with Any Kind Of Cleaning Supply and those influences are put on full blast. Howling out half-rhymes about depression and pounding out squealing stop-start riffs, "idontrememberthelasttimeihadfun.net" is the first taste listeners get of Perrin's impressive one man band. Originally released under his recent Familyphotos moniker, "Goosebumps" is the type of cool, sleepy composition that Tidecruz's fans love him for. Featuring a featherweight piano track and equally soft vocals, Tidecruz lulls listeners into a peaceful rest before vanishing as quickly as he appeared. One of the last songs Dev3n was involved with was the monstrous "Flux" with Domineko and Squibs. On his newest solo endeavor Dev3n has taken a step in a more soulful direction. A bright, continuous guitar bit lightens up the otherwise minimal production and allows Dev3n to rhyme undistracted. His SoundCloud bio notes the tracks posted are "song sketches" and he isn't quite singing into a microphone on this one, but Alex Leslie's "prints.wav" is still a dazzlingly simple and emotional piano ballad. Hardly any additional information is provided on any of his songs and many are much rougher than this, but a peek at Leslie's catalog offers a mysterious view of a young Kansas City songwriter taking an unorthodox approach at posting his music online. Lawrence R&B singer Raymond's new single "Elevator" is his first since his EP "Good Girls, Bad News" released in February. Complete with an easy groove and sleek yet subtle production from Bradly Bones, this bubbly college town pop jam is capable of making nearly any party go up. Catch Raymond performing with the Vivid Zebra crew at the next Shuttlecock show at Mills Record Company in December. NAI - "Costa Del Sol"
Kansas City producer NAI (Ian McFarlin) recently released his EP "Tokyo Noir 2071," a charming eight song grab bag of instrumental hip-hop. The song "Costa Del Sol" combines samples from saxophonist Stan Getz and guitarist Joao Gilberto with simple kicks, snares, and snaps for an irresistibly sunny cut. Check out past Hometown Highlights updates here.